We love red beans and rice and not just on Mondays. Red bean soup is just as good. Starting a meal with soup is a good thing, one advantage being that eating soup can quiet down cravings for a huge amount of food. With red bean soup however, you might have to control your cravings for more red bean soup. Yes, it’s that good. Drain the overnight soaked beans. 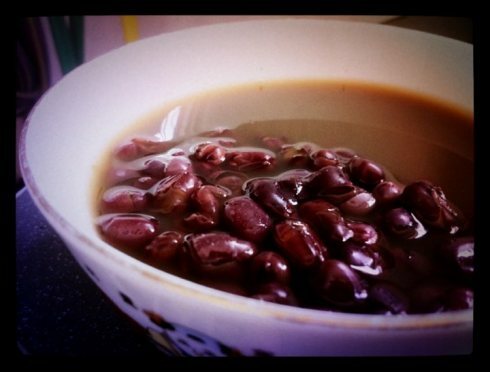 Or to quick soak: cover the beans with plenty of water in a saucepan and bring to boiling. Shut the flame off, cover and let the beans soak one hour. Mix together the holy trinity (onions, celery, and bell pepper). Melt the butter over medium heat in a Dutch oven. Add 3/4 of the holy trinity and just 1 Tbsp of the Creole Seasoning. Turn the heat to medium high and cook this for about 7-10 minutes, stirring occasionally until the vegetables start to get some color. Add the drained beans and cook, stirring occasionally for about 5 minutes, or until the liquid from the vegetables is absorbed. Add the chicken stock or water, diced ham, Andouille, garlic, bay leaves, the remaining trinity and Creole seasoning. Bring this to a boil, and then reduce the heat to a simmer. Let this simmer for 2- 2 1/2 hours. After the beans have cooked for two hours, add the Tomato Sauce, Parsley, Hot Sauce, Worcestershire, and 1/2 of the Green Onions. Cook the beans for another half hour. Puree 1/3 of the soup, being very careful to avoid any pieces of Andouille, and bay leaves. To serve, remove the bay leaves. You can garnish with 2 hard boiled eggs, chopped and the lemon slices. Here is a fine soup of humble origins. Red bean soup is deservedly delicious. This sounds fabulous! I could really go for some, right now! Ooh thanks Anthony, I know what's for dinner tomorrow! MMmmmmm I am a big bean eater. Just got finished eating refried beans at a local mexican restaurant. I love beans! One day last week, I ate an entire can of black beans. Just that. Black beans. For some odd reason, Mrs. Penwasser didn't let me sleep in our bedroom that night. I love red beans and rice. Never thought of making soup with red beans. Yummy! I do so love soup and never know what to do with red beans. Obviously, this is going to be my next endeavor! KALYANI: Yes, and tasty too. LYNN PROCTOR: You are welcome, enjoy this creole favourite. JEAN: We love this soup and it reminds me oif the Crescent city. Thanks Jean. GENE POOL DIVA: Thank You, I'm flattered. MY JOURNEY WITH CANDIDA: I'm a big bean lover myself, have a few pressure cookers. Thanks for your kind words. AL PENWASSER: How odd! Perhaps the Mrs should share the can with you, you know, for the sake of harmony. LADYDRAGONFLY: OK, loving red beans and rice - you are sure to love this soup. JOANNE: This noble endeavor you are about to embark on will definately pay huge taste dividends, I assure you. My husband and son would both definitely like this soup. My husband would also like that it has Tabasco sauce in it. He puts that on almost everything. Thanks for sharing this recipe. SUSANNE DRAZIC: Your spouse is OK in my book. Has he ever tried "Sriracha" sauce? it is a nice piquant hot sauce.